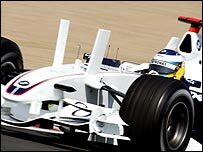 Formula One bosses have banned on safety grounds the two vertical white fins or "Twin Towers" used by BMW Sauber at the French Grand Prix. The FIA wrote to all 11 teams after the race expressing concern that such devices may impair drivers' vision. Jacques Villeneuve insisted they worked well and did not impact on visibility during the Magny-Cours grand prix. But team boss Mario Theissen accepted the ruling and said the aerodynamic device would not be used again. "We respect the FIA's decision to ban such elements," he said. "The vertical wings obviously presented a new aero solution within the rules. "The knowledge we gained from this will be included in our future development programmes." The two white fins on the nose of the BMW were dubbed the "Twin Towers" as a nod to the Kuala Lumpur skyscrapers owned by Malaysian oil giant and team sponsor Petronas.